Ultrasound scan is the first line examination for fetal abnormalities. However, in some circumstances, fetal magnetic resonance imaging (MRI) could be indicated to complement the diagnosis of the ultrasound examination. Thanks to the development of ultra-fast sequences, fetal MRI allows images with a better tissue contrast as compared to ultrasound, with a larger field of view, without limitation by maternal obesity or decreased amount of amniotic fluid. Fetal MRI as performed using 1.5 T magnets, being the most common magnets, has been shown to be harmless for the fetus. Fetal MRI will be performed while the patient lies on a bed that slides inside the magnet. The examination is quite noisy, therefore patients will have to wear a headphone for ear protection. The examination duration will depend on the indication and can vary from less than a minute to around 30 minutes. In general, a standard fetal MRI examination last for about 20 minutes. 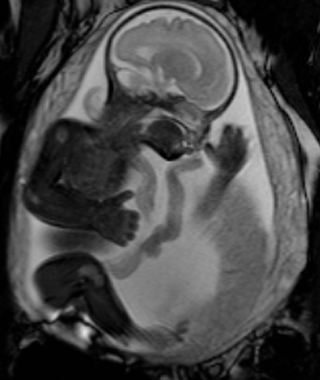 The fetal MRI examination is performed from about the 20th week of gestation. Depending on the gestational age, a medication (0.5 mg of flunitrazepam) will be given orally to the patient half an hour before the examination in order to sedate the fetus, which will allow obtaining better image quality as well as shortening the examination time. However, such a medication has also a sleeping effect on the patient. Therefore, it is recommended that the patient is accompanied by another person when coming to the hospital for such an examination. Fetal MRI indications are variable but mainly such an examination will be indicated for brain pathologies, including in case of toxoplasmosis or cytomegalovirus seroconversion. Another indication is in case of thoracic abnormalities, with the purpose to measure the lung size and establish a prognosis. Based on lung size, there will be an indication or not for fetal therapy. Various other indications exist and recent studies have shown that MRI is more precise than ultrasound for teh estimation of fetal weight.